The City offers a variety of camps over our 10 week summer camp program for children ages 3-12 years. We also offer camp over Holiday and Spring Break weeks for children in Kindergarten to 12 years. Click here to check out our available camps. 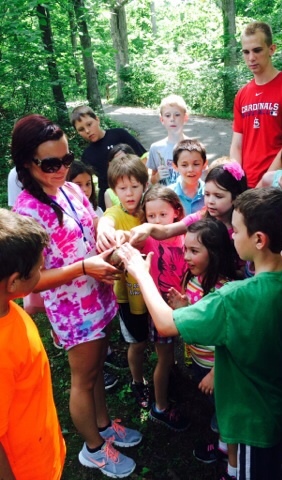 To register your child for the camp that best meets their needs, personality and interests, call RiverChase at 636-343-0067 or online at www.fentonmo.org. Full day camps that are held from 9:00 a.m. - 3:00 p.m. These camps are designed for ages 5-12 years old, (5 year olds are required to have completed Kindergarten in order to register for any full day camp). Before and after camp care is available as well. This is only available for full day camps. Pre Camp - 7:00 - 9:00 a.m.
Post Camp - 3:00 - 5:30 p.m.
A half day camp for ages 3-5 years, held from 9:00 a.m. - 12:00 p.m. (5 year olds who have no completed their first year of Kindergarten). It is also recommended that our Kinder Campers be potty-trained to attend camp.